Kids Can Press, 9781771385749, 32pp. Every Sunday morning, no matter the weather, Eli could count on Zaida to bring bagels from Merv's Bakery. Eli loved the time they spent together enjoying their favorite treats. ?Warm. Chewy. Salty,? Eli thought. ?Bagels were the best thing about Sunday.? But one Sunday, Zaida didn't come. He had fallen at Merv's and ?hurt his tuches,? and the doctor said Zaida had to rest at home for two whole weeks. This meant Eli had no Sunday morning bagels. And neither did Zaida's friends, who had been receiving their own weekly deliveries from Zaida. Will they all go hungry for bagels on Sunday? Or is there something Eli can do? 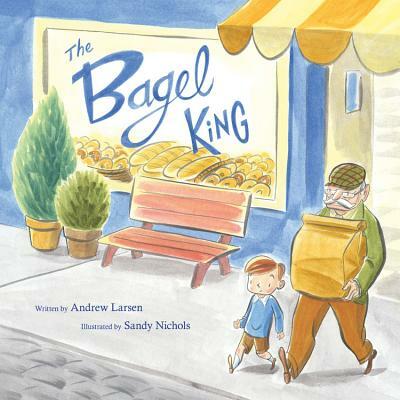 Award-winning author Andrew Larsen's picture book story offers a gently humorous take on the special bond between a boy and his grandfather and the simple ritual that looms so large in their lives. It also highlights a terrific character education lesson about how a young child can take responsibility and, with a little initiative, help a family member in need. With a blend of retro and contemporary styles, Sandy Nichols's softly colored illustrations cleverly convey the story's timelessness and capture Eli's diverse neighborhood. This book will spark wonderful discussions about family traditions and community. A mini glossary and pronunciation guide for the Yiddish words that are sprinkled throughout the story (like mensch and oy) provides an opportunity to learn about the many words we use in English that come from other languages, and to explore the connections between culture and language. Sandy Nichols is the illustrator of Starring Lorenzo, and Einstein Too, and the 40th anniversary board book editions of Alligator Pie and Garbage Delight. She also illustrates for magazines and advertising clients. Sandy and her family live in Calgary, Alberta.